The Cathedral Basilica of SS. Peter and Paul has long been a place where people have raised up all manner of human needs to God. One urgent need is for healing of a deadly scourge of our time: addiction to drugs and alcohol. About 100 people either active in their addiction or in recovery from it, along with their loved ones, gathered for a Mass on Saturday, March 11 at the cathedral “to draw strength from one another in the power of faith,” according to promotional material. Father Dennis Gill, rector of the cathedral preached the homily at the Mass for healing and recovery. Fathers Kenneth Brabazon and Charles O’Hara concelebrated the Mass. While alcoholism and drug abuse have always wreaked havoc with the lives of the addicted and their families, the current crisis of drug overdose deaths is taking an especially heavy toll. Deaths to due overdose of illegal heroin or prescription opioid painkillers climbed to 900 in the Philadelphia region in 2016 – and it is rising every year. From city and suburb, and among rich and poor, addiction does not discriminate. 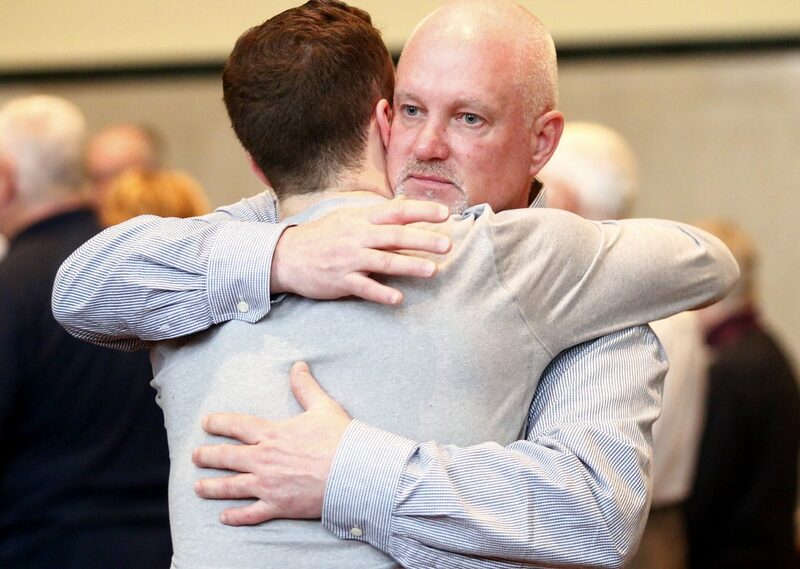 Montgomery County resident Mike Collins knows that well, because his son deals with addiction. Last fall Collins asked Archbishop Charles Chaput for permission to host the special Mass at the cathedral as a way to bring people throughout the region together in prayer on this issue. For him, spirituality is part of the healing process. “The Mass and the Eucharist are important, that spiritual part of it. It’s very uplifting, along with the medical and psychological” aspects of recovery, he said. And while the Mass helped the people attending it, such outreach is also good for the church itself, Collins believes. The Catholic Church’s concern for people struggling with addictions goes beyond prayer as it dovetails with the mission of Catholic Social Services (CSS) of the Philadelphia Archdiocese to promote health and strengthen families. CSS refers individuals to rehab treatment programs in the region and offers recovery support through programs like Mercy Hospice. The center city Philadelphia facility provides housing and comprehensive services to more than 30 homeless women and their children. Stoner acknowledges what anyone close to a person dealing with addiction already knows – addiction takes a heavy toll on the person’s family as well. That is why it is important to build a solid support network to promote long-term, lasting recovery, Stoner said. The formerly homeless women in recovery from substance abuse, in particular mothers with young children, who come to Mercy Hospice find housing and supportive services, life skills and parenting education, case management, enrichment programs and child care in a safe and loving environment. Women and men who seek healing and recovery from addiction can find 12-step groups operating at many churches in the Philadelphia region. Members of the Calix Society, a support group for people recovering from alcohol addiction, meet regularly at three Catholic parishes in southeastern Pennsylvania – the Our House Ministry at St. Gabriel’s in Philadelphia’s Grays Ferry section, Nativity B.V.M. in Media and Queen of the Universe in Levittown – and in Wilmington, Del. Anyone interested in joining the meetings is welcome, and more information is available on the Calix Society website. Resources for learning more about recovery from addiction, and helping those dealing with it, are available from RecoveryWell.org. Learn more about Catholic Social Services programs to help people toward healing and new life here, or call the CSS Helpline at 267-331-2490 (Monday to Friday 8:30 a.m. to 4:30 p.m.) to speak with someone. At St. Norbert’s Parish in Paoli, we have been holding monthly 12 Step Spirituality (2nd Sunday of the Month at 7:30 pm) and Addiction Prayer Nights (4th Thursday of the month at 7 pm) for almost 3 years now. Stigma is still very present in our society and, sad to say, church. But we are slowly organizing and moving forward to Unite Catholics to Fight Addictions. This is a battle against pure evil. Thank you for holding this mass and I hope this is just the beginning.